California upset Utah in spectacular fashion in Berkeley last February, and the Bears will be hoping to summon the same magic in a friendly scoring environment. 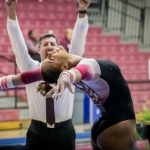 They’re coming off a strong win at home where they set a new program record on beam, and lineups look to finally be settling down. That might not be enough to take the incredibly consistent Utes though. Utah has a score range of only three tenths this season, never dipping below the 197 mark, and it certainly has room to grow. Good to see Bordas moving back in the floor lineup! With how Cal’s been functioning this year, that means she’s less likely to be pulled. LEE – UTAH: Her usual nice full. Not the highest, hop back, but nice flare. SEILNACHT – CAL: Blind to pike Jaeger, not the highest, to overshoot, blind to Rudi dismount. ROBERTS – UTAH: Similar full to Lee, great block, shuffle back with one foot on the landing. JONES – SEILNACHT: Lineup change, this was supposed to be George. Maloney to Pak, quite archy, full twisting double back clean and STUCK. Nice. BURCH – UTAH: Twisting on a bit on her full, nice in the air but not massive, step back. KUC – CAL: Maloney to Pak, beautiful, FTDB dismount with a hop. So pretty. 9.775 feels low, maybe she missed a handstand somewhere. MERRELL-GILES – UTAH: One and a half, beautiful in the air… bends and re-places one foot, but pretty close to the stick there. WATTERSON – CAL: Love her construction. Pak, toe on to van Leeuwen beautiful. Toe full to double back, little arm shift to hold the stick but GREAT. SKINNER – UTAH: Sitting out floor tonight after whatever that little ankle situation was. Not big off the table on her double full, comes in just a touch short but it’s good with just a little hop. SCHANK – CAL: A little too far on her Jaeger, touches the bar but her dowell must have been misplaced because she drops. The rest is okay, hop on her double lay. TESSEN – UTAH: One and a half!! With a step forward. So good to see that one back. BORDAS – CAL: She was subbed out last week so she didn’t have to follow a fall. Jaeger is HUGE to overshoot, nailing this so far, blind full double back stuck. C L U T C H.
Some of those Cal scores felt a little low, but we couldn’t tell much about handstands. Incredibly impressive for Bordas, who’s been in and out of lineups all year. Great, clean start from Utah. SY. SEILNACHT – CAL: Twisting on a touch, slight pike, but stuck. Really good start. LEE – UTAH: Oh Amanda. A jump over the low bar to the high is not a unique bars mount. Jaeger to overshoot I think, I was too busy despairing at the commentary, half to half to double back with a step. JONES – CAL: Nice full, good body position. Comes in a little short and shifts her toes forward on one foot. DULA – UTAH: Short on the first handstand, blind to Jaeger with bent knees in the air. Love her toes. Stalder to double back with a hop back. MASTRANGELO – CAL: Tons of distance on her full, small hop back. TESSEN – UTAH: Blind to Jaeger, always catches that a little close with her feet way above her. Okay bail, maybe short on a handstand, FTDB and stares at her feet until she’s sure they’re not moving. Good one! CLAUSI – CAL: One and a half, touch of leg split on the table, small hop back. Missy Marlowe is on her feet and waving a 10 sign, which is hilarious. MERRELL-GILES – UTAH: Deltchev, short on a handstand. FTDB and couldn’t see her feet on the dismount because Tom Farden was in the way. 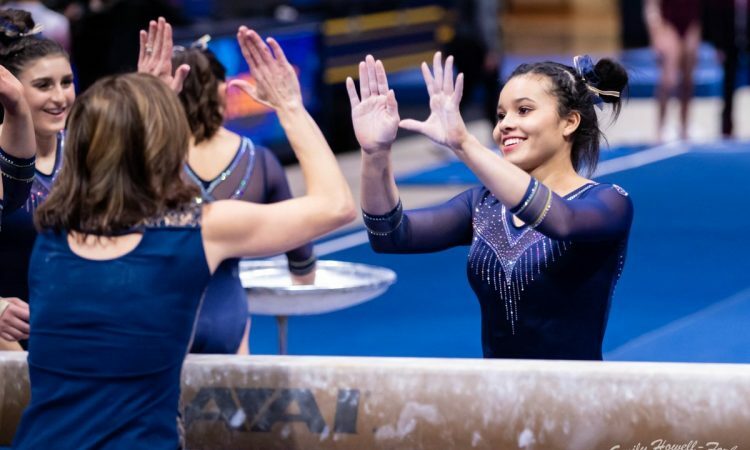 WILLIAMS – CAL: Full isn’t her biggest, hop back. REINSTADTLER – UTAH: Short on a handstand, toe blind to Jaeger nice, another questionable handstand. FTDB with a hop back. Not her best one. GEORGE – CAL: Okay full, not huge again, small hop back. SKINNER – UTAH: Arch over on her first handstand, good Ray, bail. Toe on to FTDB and a little bounce on her toes. Utah’s handstands were on vacation today, nearly everyone had one fairly serious miss. It got through fine and is still on 197 pace, though it’ll need the 9.9s if it wants to keep pace with the top three. Cal was okay not great on vault, wasn’t there with its landings today. MCNATT – UTAH: Split double stag, front aerial tentative with a leg up check, repeats it to a BHS, off line with a step back and an arm swing. Full turn, kinda front attitude-y, beat to sheep is aggressively poor. Gainer full dismount is flung way back, shifts her toes forward but hangs on. SO. SEILNACHT – CAL: Front lay to Rudi to double stag, travels a bit on the leap as usual. Always difficult dance, one and a half Barani split, one and a half front pike stuck-ish. Really solid start. SOLOSKI – UTAH: Not a standby on beam. Front aerial, check, repeats it to BHS exactly like McNatt. Hitch kick switch half, well short, punch front full dismount with a step. 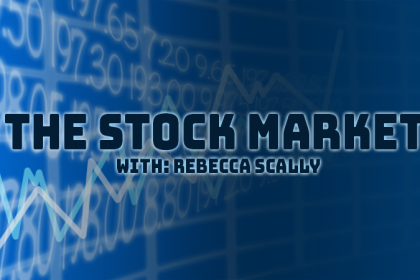 MASTRANGELO – CAL: Will we see the full in today? Yeah!! Great. It’s almost more half in half out. One and a half front lay, airy and controlled, switch side to Popa. Two and a half twist, bigger step but stays just in bounds. MERRELL-GILES – UTAH: Switch split, triple series good with a weird adjustment. Almost swivels her knee to stay in line. Front aerial to wolf, one and a half twist stuck. Fantastic recovery from a wobbly start. 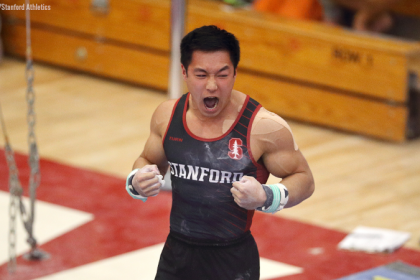 GEORGE – CAL: Love the performance quality in this routine. Front thru Rudi I think, switch ring thru something… clearly my focus is slipping haha. Front double full great, good control, punch Rudi with a bigger step. LEE – UTAH: BHS LOSO, great, switch straddle quarter. Beat side aerial back full with a hop. BORDAS – CAL: Double pike, almost stuck, little toe bounce in place, switch ring switch half. Rudi is beautiful, one and a half front lay, bit whippy on the layout. So good, though. RANDALL – UTAH: Full turn, BHS LOSO with a leg up check and a lean. Some leg form too. Beat to sheep, not cute at all, switch to split short of positions and the connection was slow. Good Rulfova, double full dismount with legs staggered on landing. CLAUSI – CAL: The choreography is just fantastic, apparently Clausi didn’t like it at first and Missy encouraged her to just trust Liz. Full in big, scooted the front foot, switch side wolf full. Front double full, dances out, one and a half front lay, bigger step out. SKINNER – UTAH: BHS LOSO, knees usual, side aerial to sissone a bit short of split. Full turn, switch to straddle… no back tuck today. Double back with a hop back. SY. SEILNACHT – CAL: Toni-Ann out to make this happen, lineup change #2 for the Bears. Double pike, bigger lunge, switch full to sissone I think, front lay front full. Out of bounds on her dance!!! Both teams putting together solid but not perfect meets. Utah probably has this locked up despite some errors on beam. I can’t believe Sylvie actually went out on her dance like that. The commentators didn’t even catch it but the ND did come out of her score so I’m not crazy. GEORGE – CAL: Front aerial, tiny little hip bend, BHS LOSO with a lean. Split to LOSO. Touches of leg form throughout too. Switch split, gainer full stuck with just a little rock back on her heel. ROBERTS – UTAH: Front layout to Rudi, beautiful control. Double pike, her dance is a lot better than I remember. Well done on the front combo pass. CLAUSI – CAL: Switch switch nailed, no question. 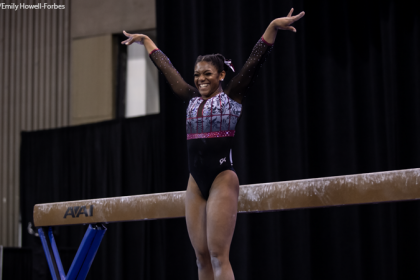 BHS LOSO… looked like she was going to miss the beam with her back foot but keeps her nerve and gets it down. Hitch kick side aerial back full. Great. LEE – UT: Two and a half twist, quick step out, front lay front full with another quick step. Double full to LOSO. KEELEN – CAL: Full turn, BHS LOSO landed with her arms all the way up. Split to ring jump, front aerial, one and a half dismount with a hop. She’s so solid on beam these days. BURCH – UTAH: Had a computer issue and missed most of this routine. SO. SEILNACHT – CAL: BHS LOSO great. Switch split beat, side aerial back full STUCK. Really solid routine. RANDALL – UTAH: Counting Stars is the music, full in, lands staggered, switch side Popa. One and a half front lay, double pike a little underrotated but makes it work for a stick-ish sort of thing. WILLIAMS – CAL: Front tuck, hop, LOSO. That might be enough to kill the connection, full turn, switch straddle quarter. Gainer pike stuck, back on her heels. SOLOSKI – UTAH: Double lay, great. Double full. She’s got such good landing sense, really knows how to milk them, and a great performer too. One and a half front lay, misses the punch. Fights the front lay around, lands on her heels, rebounds back. That was WILD. TAW did in fact lose her acro series. Bordas needs to be clutch again. BORDAS – CAL: Weird issue on her mount. Switch switch, good, she’s been super tentative on that before but that was great. BHS LOSO, front aerial… tentative and falls. Side aerial, hop on dismount. What a bummer of a beam rotation for Cal after a really solid meet but the final score wasn’t a problem. Utah was good on floor but had enough little errors sprinkled through the meet that it couldn’t break out of its low 197 rut—not that that’s in any sense a bad score, but Utah wants to be one of the best in the country and it’s currently a fair bit behind.